Happy New Year! Fireworks and dogs don’t go well together. Hasn’t 2018 gone so quickly! Seems like the older we get the quicker it goes. New Year’s Eve is a great time to celebrate and bring in 2019 by watching the host of fireworks displays happening around our suburbs and cities. While we humans love seeing the skies light up, many of our canine companions do not. The sudden loud bangs, smells, smoke and bright light show can be confusing and a terrifying experience for our pets, even at a considerable distance. A study into domestic dogs and their response to noises, like fireworks, showed 49% of our dogs demonstrate behaviours consistent with fear and anxiety. 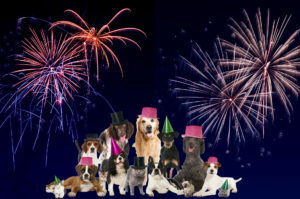 You see, dogs have a very acute sense of hearing, so loud bangs, whistles, buzzing, hissing and crackling, as fireworks do, can literally cause them pain. I once heard of a little Jack Russell so scared of fireworks, he scaled a 6 foot fence to try and get away. Now if your dog has a diagnosis of noise phobia, make sure you chat with your vet about strategies for getting through tonight. Now, if you are home tonight, here’s some ways to help keep your dog calm and safe? Supervision and being indoors will go a long way to making them more comfortable. Remain calm yourself… if you are anxious your dog will know and think there is something to be anxious about. Make sure you reinforce calm relaxed behaviour with food or toys. If you’re having people over tonight, make sure they all are aware they need to shut doors and gates. Mask the noise, smells and lights outside by closing windows and curtains, try playing some calming music or use the TV as a sound distraction and try to keep them in the middle of the house away from external walls. Don’t force your dog to go outside. Don’t tie your dog up! Even in a few minutes of panic they can do significant damage to themselves. Make sure your home and yard is secure. Leave them inside, with some calming music on, or the TV going, with something relaxing on to dull out the sounds of the fireworks. Confine them to an internal room in the middle of the house with windows, curtains and doors closed. Finally, make sure you do not punish or tell your dog off for being afraid… they don’t understand why something so terrifying would be fun for us. It’s definitely a cross cultural experience. Australian Open- Champions, tennis and balls! Saving lives in the nick of time.